Brief Description: Broadfleaf weed distinguishable by its purple flowers on a round base. Covered by “pricky” areas on the leaf and flower that can cut skin. Thistle can refer to several different species of broadleaf weed, but most commonly refers to “Canadian Thistle” which, ironically, is a misleading name since the plant is not actually from Canada. 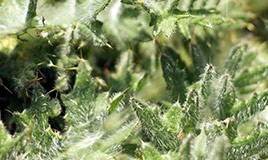 Canadian thistle is prickly all over, and can cause pain at the site of a sting. Though there are different types of thistle, the most recognizable type has a purple flower sprouting from a round bulb-like shape at the top of the stem. These flowers, which are related to dandelions, turn into a very white hair-like puffs that help seeds float around the lawn and spread quickly. Thistle spreads quickly once it turns into a seed, so if you are removing thistles by hand make sure you do so long before the flower has changed. Thistle seed can also bury itself deeply, so aerating and seeding as much as possible will prevent thistle from receiving enough nutrients to grow. Thistle that is removed before it has an opportunity to spread may not sprout new broadleaf weeds. But once it has started spreading you are going to need some type of application to remove it from your lawn. Contact Green Lawn Fertilizing today to learn more about our green lawn and broadleaf weed removal services.